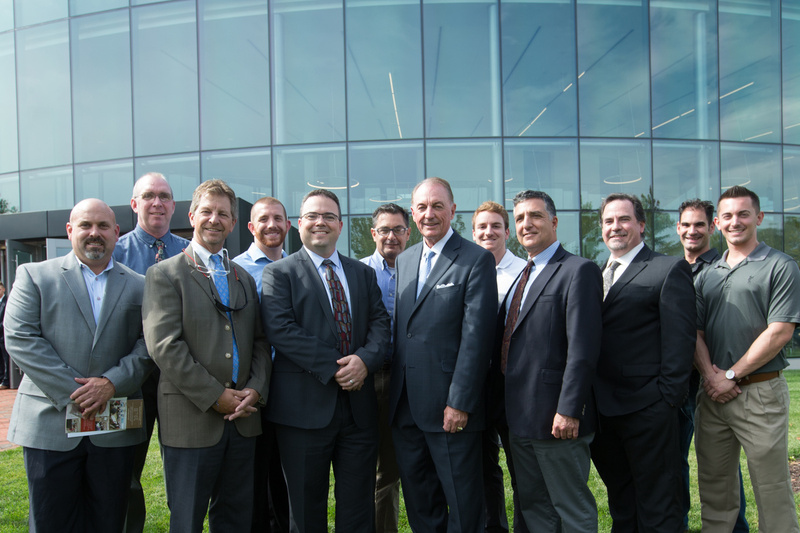 (Boston, MA) – BOND, the Northeast’s premier building, civil, utility and energy construction firm, recently celebrated the completion of Bryant University’s Academic Innovation Center (AIC) and the Chace Wellness and Athletic Center expansion. Both projects are part of the University’s Bryant Builds program, a plan that has added more than 250,000 square feet of innovative facilities to both the Smithfield, Rhode Island campus and in Zhuhai, China. Designed by Einhorn Yaffee Prescott (EYP) Architecture & Engineering, the AIC building is an active, immersive, and collaborative learning environment that supports all academic programs at Bryant University. Within its 48,290 square feet are flexible classrooms, movable walls, lounge seating, mobile workstations, a café and welcome center. A distinguishing feature is the Innovation Forum, a 5,000 square-foot, three-story space in the center of the AIC. In addition, BOND completed the renovation and expansion of the Chace Wellness and Athletic Center. Working closely with Sasaki Associates, BOND constructed a two-story, 6,700 square-foot addition and 3,400 square-foot renovation, including a new Sports Medicine and Training Center. BOND also constructed office space for the Athletics Administration and Bryant’s Division 1 Football program. “BOND is proud to be part of these exciting new projects on Bryant’s campus, continuing our long-standing partnership with the University,” said Robert Murray, BOND President. “These buildings are a culmination of innovative design, teamwork and commitment. We are thankful for the university’s confidence in us to deliver two new buildings that redefine higher education and wellness. The AIC and Chace Wellness Center opened on time and under budget for the start of the 2016 Fall semester. The Bryant community joined President Ronald K. Machtley to celebrate the grand opening of the AIC with a ribbon cutting ceremony. Attendees included Bryant faculty, students, alumni, members of the Board of Trustees, government dignitaries, along with the BOND project team. There was a ribbon long enough for more than 60 guests to participate in its cutting. With these projects, BOND maintains its strong ongoing relationship with Bryant University, also having completed a 33,000 square-foot renovation of the university’s Salmanson Dining Hall, which includes upgrades to the property’s kitchen, server, and adjacent office space.